The silence and peace of winter continue and slowly the days are getting longer. We know spring and summer will come according to their causes just as we know full awakening will come when its causes are complete. Take a look at the Abbey life photos here. Nearly 50 people participated in the New Year’s retreat which began with several inches of snow. We visualized each snowflake as a Vajrasattva showering peace and bliss upon all sentient beings. After meditation, teachings, and sharing their thoughts in discussion groups for several days, everyone departed feeling refreshed and ready to spread kindness to whomever they encounter. We received many comments from participants afterwards saying how glad they were to spend New Year’s at the Abbey, calming and purifying their minds instead of engaging in the usual New Year’s Eve activities. See photos here. Video recordings will be posted shortly. After the New Year’s retreat, our attention turned to the final preparations for the Living Vinaya in the West program. We’ve been planning this program for years-it required much more organization than our usual courses and retreats, and everyone stepped up to the plate to contribute as we transformed the Abbey into a facility that could house close to 60 people. To do this, the dining room became the teaching hall, with a stage for the Dharma master to teach from. A lot of new AV setup was necessary, and the rooms for the visiting faculty were beautifully arranged. See photos here and here and on Facebook. Of course, the heat in the lower floor of Chenrezig Hall stopped working and the water heater in Ananda Hall broke the week before the course, and the Internet was up and down during the first week. 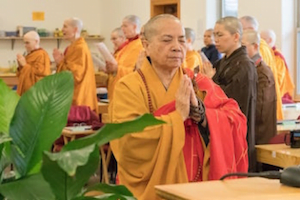 Venerable Bhiksuni Master Wuyin and six of her disciples arrived on January 21. All course participants awaited them in the meditation hall with katas in our hands. There was a formal welcome and then Ven. Wuyin spoke about her joy in being with us at the Abbey. Teachings began the following day, with Ven. Wuyin teaching the morning sessions, and one of her disciples-usually Ven. Jenkir-teaching in the afternoon. Ven. Chodron often spoke at the conclusion of the afternoon sessions as well. From the very first day, the group bonded. Every participant was sincere and eager to learn. All of us-both those who live in communities and those who don’t-were delighted to be together with such a large number of nuns, and the sound of our chanting together was in one harmonious voice. 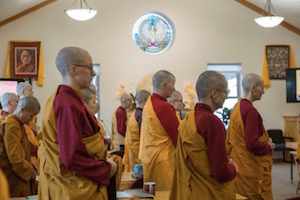 Seeing the importance of monastic education in the Vinaya-the monastic code of conduct-the Abbey sponsored the course, and we are grateful to all of you who shared this vision and contributed sponsorship, ranging from helping to cover several international air tickets for the faculty to sending a truckload of fresh veggies to the Abbey. We’re very grateful to the many volunteers who spent from three days to three weeks at the Abbey helping to prepare meals and clean. We also appreciate all the local supporters who drove the participants to and from the airport to the Abbey and also those who hosted nuns with early morning flights or late night arrivals. 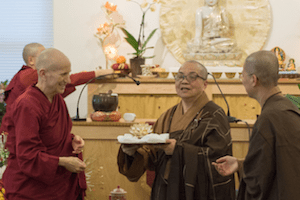 We rejoice in the merit that all of you created by making offerings to and assisting the sangha. During the initial convocation, Ven. Master Wuyin offered gifts to the Abbey. Among them was a crystal lotus lamp for the altar. 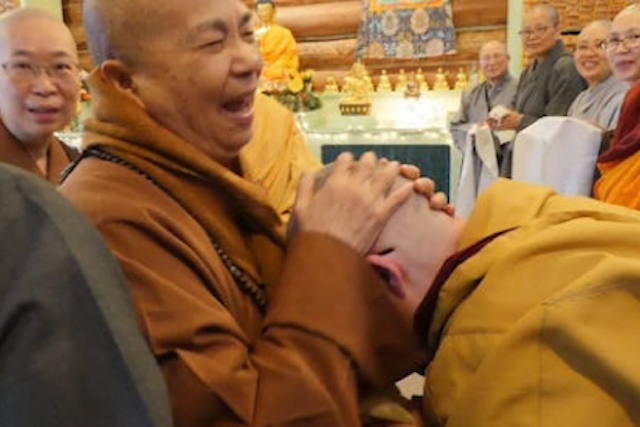 One of Ven Wuyin’s disciples commented, “It was so meaningful to see the abbess of Luminary Temple light the lamp for the abbess of Sravasti Abbey.” And indeed, it was. Lion’s Roar posted an article about the program here. 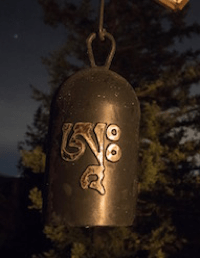 The SpokaneFAVs website also wrote about Living Vinaya in the West here. Resident and guest nuns are giving Bodhisattva’s Breakfast Corner talks during the course. See them all here. Vinaya course photos courtesy of Gen Heywood Photography. As the year turned to 2018, Prajna Cottage neared completion. We were all awaiting occupancy, especially Ven. Chodron who dreamed of a hot shower without having to walk in the snow, and Ven. Tsultrim who eagerly anticipated relinquishing her job as keeper of the compost toilet in the writing studio. Watch Ven. 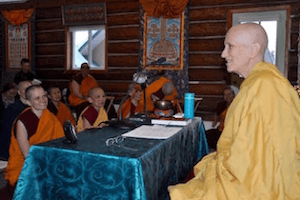 Samten’s video rejoicing in the completion, Bhikshuni Thubten Chodron Has Moved Into Prajna Cottage. All of her students rejoice that she now has indoor plumbing! Stephen, the Dharma student and architect who designed the cottage, wrote a dedication poem for it. Read the poem here. Retreat from Afar starts February 16. Find info here. Due to the kindness of Ven. 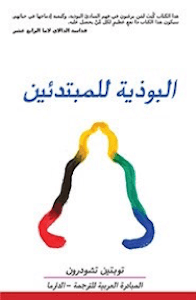 Dhondrup, an Egyptian monk studying at Nalanda Monastery in France, Buddhism for Beginners has been translated into Arabic and is available for free distribution. Check it out here. Read Ken’s reflection about political bias and having compassion for those with different views. Luis, a Dharma student in his early 20s, shares about freeing himself from being a prisoner of love. Read his reflection here. Read Mont’s sharing about his experience in waking up to deal with his anger. Read how Angel Tree generosity made the best Christmas ever. Photos of Ven. Losang’s and Ven. Pende’s full ordinations in Taiwan are now on this website.